When I learned how to make a seven layer Mexican dip recipe, I found that it is not truly Mexican but more of the Tex Mex versions of recipes. 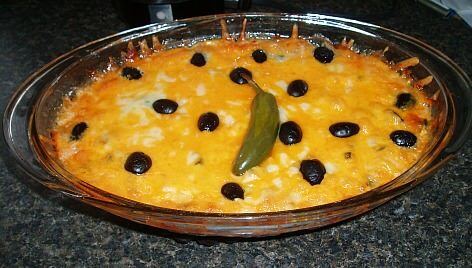 There are quite a few different recipes for the layered dip combining the Mexican flavor with American ingredients. Most have originated from the makers of the products used in the recipes; Philadelphia cream cheese, Pace products, Old El Paso, etc. After I learned how to make a 7 layer Mexican dip recipe, I made up a huge list of ingredients which can be used. You could pick and choose from this list to make up your own favorite recipe for this dip. There are also recipes for hot dips and for cold dips. 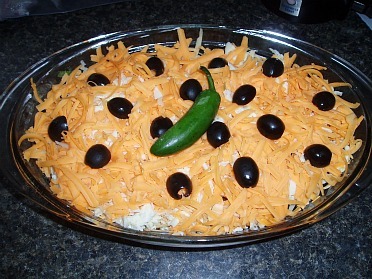 Whichever I choose to make for the seven layer Mexican dip recipe, I prefer it to be hot. The ones that I like best all have cheese; nothing is better with chips than hot melted cheese. If you are learning how to make a seven layer Mexican dip recipe, you might choose to use only a few of these instead of seven. You might even choose to make more than 7 layers. When I look at some of my recipes, I wonder how they are counting the ingredients as layers because most of them contain more than seven ingredients. Any dip created with these ingredients will surely be a hit at your next party no matter what the occasion. This layered dip makes a great super bowl recipe, New Years Eve recipe or just for a casual gathering. In a glass bowl, first layer the refried beans. Cover the beans with a layer of the mashed avocados. Mix the seasoning in with the sour cream and then layer it on top of the avocados. Next layer the Cheddar cheese. Sprinkle the cheese with a thin layer of chopped green onion, then a thin layer of sliced black olives and top with a few chopped tomatoes. Serve cold with tortilla chips. Combine the beans and the seasoning; spread evenly in an 8x12 inch baking dish. Next layer the avocado dip, then layer the sour cream. Next spread a layer with the olives, then a layer with the chopped tomatoes. Green onions and the green chilies. Finally top with the cheese. Heat in the oven at 350F degrees until heated thoroughly and the cheese is melted. Serve with Doritos. You can use this as the basic recipe and make the seven layer Mexican dip recipe by selecting another ingredient from the list. Layer all ingredients in the order; serve with Tostitos.